Over the weekend a new Samsung developed app appeared in the Windows Store. The arrival of this app has sparked talk about a new Samsung Windows device in the making; however it is uncertain what form factor the device will be in. And pattern log-in features like on Android Galaxy devices. 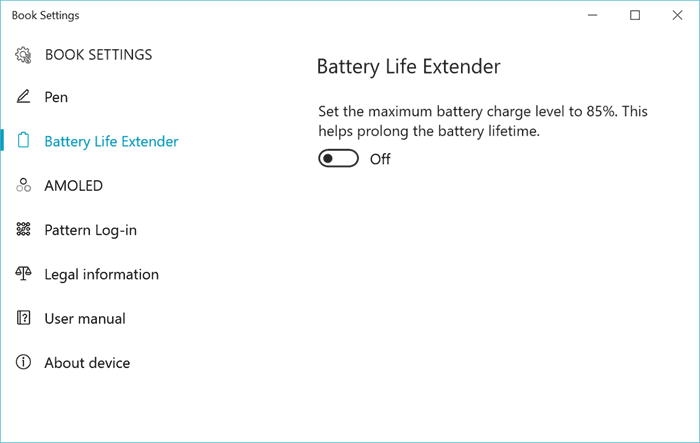 The app description says users should "Install 'Book Settings' which includes Battery Life Extender, Screen mode, Pattern Log-in, User manual, and other Samsung features. Book Settings is an application for Galaxy Book. It may not function normally on other devices." Furthermore, it is noted that the app is compatible with regular Windows PCs and Windows Holographic. Unteil quite recently Samsung reserved its branded 'Galaxy' devices for Android, and used the ATIV sub-brand for Windows devices. That was until last year, when the Intel Core M powered Galaxy TabPro S was released. MSPowerUser reminds us that Samsung trademarked Galaxy Book back in 2012 for "Tablet computers, MP3 players, mobile phones, and smart phones" - a rather ancient description in tech terms. At the time of writing almost any imaginable Windows 10 device with a pen and AMOLED screen might be planned by Samsung, for all we know. However, it's an x64 app so at least we won't have to wait for the first wave of 'Cellular PCs' to see the 'Samsung Galaxy Book' materialise. What kind of Windows laptop, 2-in-1, or (foldable) tablet would you like to see Samsung make? actually I would like to see them make some windows phone devices.